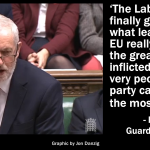 Labour leader, Jeremy Corbyn, has sparked concerns in Brussels of a no-deal Brexit after he told EU officials that he will vote against any Brexit that fails to deliver “the exact same benefits” as membership of the EU’s Single Market and customs union. Of course, that’s impossible, because Mr Corbyn has also ruled out accepting membership of the Single Market and its rules – including Free Movement of People. That, as the EU has been at pains to point out from the start, is a prerequisite for full and frictionless access to their cherished Single Market – the world’s biggest and richest free trade area, and the UK’s biggest trading partner by far. Mr Corbyn is against membership of the Single Market, because he believes it would hinder Labour from implementing its policies. This explains Mr Corbyn’s reluctance both to sign up to the Single Market, and to include a ‘remain’ option if there is another referendum. 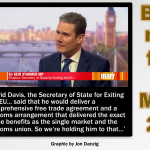 His objections to the EU or Single Market membership on the grounds that it would impede Labour’s policies have been debunked many times – for example, most European countries have a nationalised railway system. But notwithstanding that Mr Corbyn doesn’t want the UK to be a member of the Single Market, or to accept its rules including Free Movement of People, he still expects the UK to negotiate a new deal with the EU that would ensure Britain keeps the ‘exact same benefits’ of the Single Market as we have now. Of course, it’s classic ‘cake and eat it’ nonsense. It cannot be achieved. If Mr Corbyn was now in charge of negotiations with the EU’s Chief Brexit Negotiator, Michel Barnier, his proposals would be rejected in the same way as Theresa May’s. The EU have repeatedly made it clear that there can be no cherry picking to the UK’s advantage in the negotiations. “If you want access to the Single Market – including the financial services – be my guest. But it means that you need to contribute to the budget and acknowledge European jurisdiction. In summary, Mr Macron gave the same message as all the other EU member states, the European Parliament and the European Commission: to secure frictionless access to the Single Market Britain must pay into the EU budget and accept EU laws. That’s something Mr Corbyn and Labour’s front bench don’t accept. So, how could Labour do much better in the negotiations than the Conservatives? How could they achieve the ‘exact same benefits’ of the Single Market as we have now, without accepting the rules of that Single Market, including Free Movement of People? “Corbyn taking over Brexit negotiations from Theresa May is no better than swapping one shady second-hand car salesperson for another. May or Corbyn, there is no good deal that either of them will be able to grasp. The LibDems have a valid point. 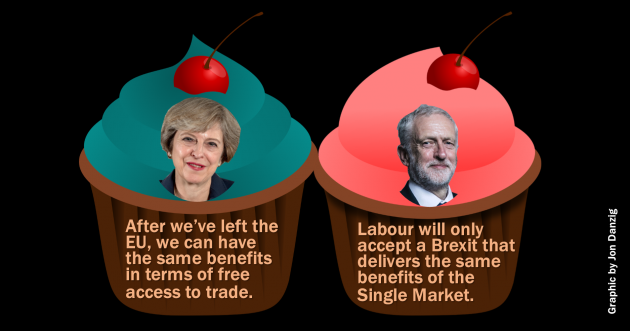 So, the Labour Opposition is offering the nation imaginary cake that doesn’t exist. And the problem is that the Tory government is doing the same. The only countries that enjoy frictionless trade with the EU are those countries that are part of the EU Single Market. Of course, the UK could have a free trade agreement with the EU similar to the ones signed recently with Canada and Japan. But those agreements don’t include frictionless access to the EU, and those agreements don’t cover all the goods that go between the UK and the EU, and they don’t cover services or free movement of people. 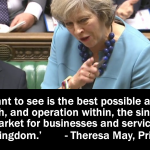 In July, Theresa May told the House of Commons Liaison Committee that the UK could have frictionless borders with the EU, without being in the Single Market or the EU customs union. We need to continue with the status quo: the arrangement we have now, the one we’ve had for over 40 years. 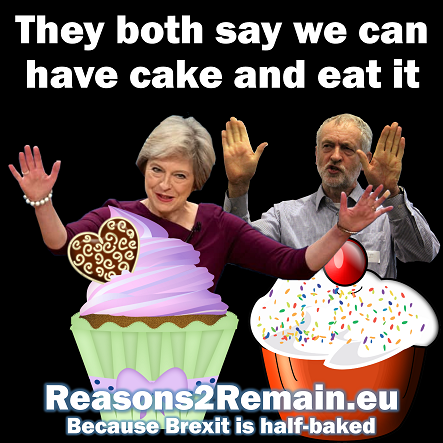 We have the best cake now – as a full member of the EU. Let’s not give that up for an imaginary cake that can never be baked, never be delivered, and never be eaten. 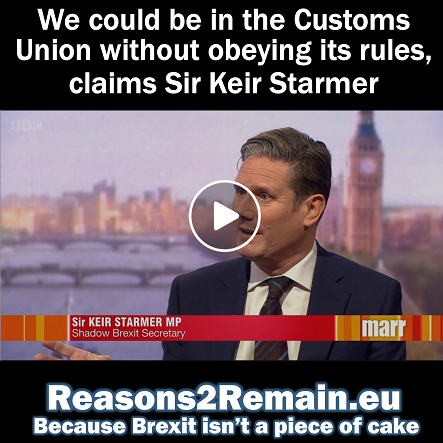 This entry was posted in Current Affairs, Democracy & Citizenship, Economics & Trade, Politics & Public Policy, The EU and tagged brexit, cake, EU, European Union, Jeremy Corbyn, Theresa May. Bookmark the permalink.